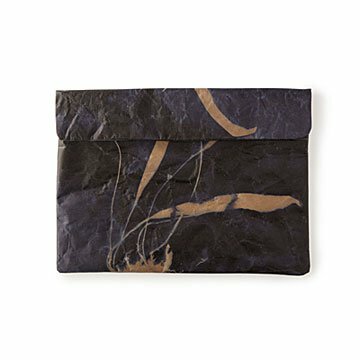 Wendren Setzer makes laptop sleeves from cement bags, with prints inspired by mid-1800s botanical photos. Driving in Cape Town one day, Wendren Setzer found herself gazing at a truck next to her, full of dry cement bags. The designs printed on the paper looked cool, she thought—so cool that she decided to try making accessories out of the paper. After a lot of experimentation, she succeeded—brilliantly. She and her all-female crew fuse it to cotton fabric, stitch it, give it a water-resistant coating, and voila: an elegantly protective laptop sleeve. Wendren collaborated with Amanda du Plessis, a well-known Johannesburg designer, on the pattern. Based on Thomas C. Blagrave's mid-1800s photographs of South African ferns, it evokes nostalgia and dreams. Beautiful, useful, original, sustainable, ethically made—there's not a single one of our favorite boxes that Wendren's sleeves don't check. Handmade in Cape Town, South Africa. The Wren Design was founded in 2008 after the owner, Wendren Setzer, took the decision to resign from her job as a textile designer at a clothing factory. She found that working for a large corporation was unfulfilling and wanted to take on a new challenge. Finding herself in need of a handbag, she decided to put her own design skills to use and made her own. This became her first product and so she launched into her new career as an entrepreneur. By starting a business that was more in keeping with her own design ideas, she had the freedom to apply a more innovative approach to product development. Her belief in the value of good workmanship over mass-produced products served as the central principle around which the business has evolved. She has kept a practical, hands-on approach to the business ever since. The first Wren bags were made from English woven fabrics. Wendren’s discovery of discarded coffee sacks at a local roaster led her to rethink her manufacturing process. The idea of using found materials and repurposing them with the aim of promoting sustainability was a watershed moment for the company. While exploring other materials options, she hit upon the concept of using paper to construct items of apparel. This marked a radical departure from conventional textiles, but it is an innovation that has proved highly successful. By treating the paper using fusion and coating technologies, the paper’s strength is greatly enhanced and it becomes a functional fabric. The result is a unique product line which can be likened to origami in its simplicity of design The natural texture of the paper also lends the product a unique tactile quality that adds to its appeal. Perhaps the most iconic example of the Wren’s product offering is the company’s bestselling range of PPC-branded bags, which are striking for the way in which they combine contemporary design ideas with ordinary materials to produce something that is uniquely eye-catching. In addition to paper, fabrics utilizing repurposed coffee sacks (the Jute Range) and antique linen (the Linen Range) are used. Wipe with a dry cloth. Keep away from wet or oil substances. Over time, the paper will crease and develop its own personality, not unlike leather.